Situated on the south coast of Gran Canaria and 70 kilometres from the island's airport, Taurito is located between the resorts of Puerto Rico (9kms) and the picturesque resort of Puerto de Mogan (4m), Taurito with its beach (Playa Taurito) is most popular with German and British families and couples, with many returning every year to this small, quiet and rather calm Gran Canarian holiday destination. The year round climate also makes Playa Taurito and the island of Gran Canaria a good choice for a winter holiday in the sun. If you're looking for good holiday amenities without the crowds and a little less hustle and bustle than neighbouring Puerto Rico, then Playa Taurito is a good choice for you although the resort like most on this part of the coast is quite hilly and may not be suitable for visitors with mobility problems. Playa Taurito beach is good for families as it's nicely sheltered with safe bathing. The beach has quite dark sand and is man -made and may not be as appealing as some of the other resorts on the island; this is probably the reason that they have built a large public lido, this extensive lagoon style swimming pool complex has snack bars, pool bars, bridges and sun terraces, open to the public for a few Euros this is a great way to spend an enjoyable day of your holidays. The resort boasts a good range of accommodation from self catering apartments and studios through to all - inclusive 4 star hotels, there are several shops, supermarkets, bars and restaurants but all in keeping with the resorts low key image. Nearby Puerto Rico has a much livelier nightlife. During the day life revolves around the pool and beach, again the beach at Puerto Rico is the place to head for if you would like water sports, fun rides, diving, fishing and boat rides. Whether you are looking for a cheap last minute holiday or a luxurious suite in a 5 star hotel you will find it in Gran Canaria. 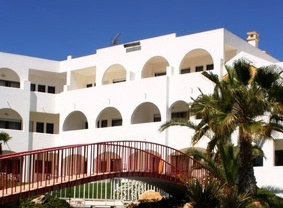 The resorts all have good self catering apartments, a wide choice of hotel styles and board arrangements including all inclusive properties. Gran Canaria is a great year round destination with accommodation to suit every budget.